Mercer County, ND switched from Mountain time to Central time in November, 2010. Daylight Saving Time runs from the second Sunday in March at 02:00 until the first Sunday in November at 02:00 in all zones. Use this table to find out what zone a specific location is in. 1883-11-18 12:00: U.S. railroads adopted standard time zones, beginning at noon. Previously, each city had observed mean solar time, as measured at its city hall. The time zone boundaries didn't respect state or county lines. ET (Eastern Time) included all of CT, DE, DC, MD, MA, NH, NJ, NY, RI, and VT. CT (Central Time) included all of AL, AR, FL, GA, IL, IN, IA, KY, LA, MI, MN, MS, MO, OH, TN, and WS. The only states entirely in the MT (Mountain Time) zone were CO and WY. PT (Pacific Time) included NV, OR, and WA. The other states were split. ME was partly in ET and partly in AT (Atlantic Time). The states that were partly in ET and partly in CT were NC, PA, SC, VA, and WV. The border between CT and MT passed through KS, NE, NM, ND, OK, SD, and TX, and the MT-PT border through AZ, CA, ID, MT, and UT. In most cases the divided states lay preponderantly in the later, more easterly zone. For example, NC was in ET except for a small strip in the Appalachian Mountains. On the other hand, CA was on PT except for a few cities along the Colorado River. 1918: The United States adopted DST for the first time, advancing all clocks by one hour from the last Sunday in March at 02:00 to the last Sunday in October at 02:00. 1933: Hawaii adopted DST experimentally, advancing from UTC-10:30 to UTC-9:30, from 1933-04-30 02:00 to 1933-05-21 02:00. 1944-09-30: Arizona, having observed War Time (year-round DST), resumed MST, except for Mohave County south of the Grand Canyon, which observed PST. 1945-03-07: Mohave County changed from PST to MST. 1947-06-08 2:00: Hawaiian Time advanced by 30 minutes, from UTC-10:30 to UTC-10. 1961: Eastern half of IN and central KY moved from CT to ET. The specific areas affected in Indiana were the counties to the east of, and including, Elkhart, Kosciusko, Wabash, Grant, Madison, Hamilton, Boone, Hendricks, Morgan, Johnson, Shelby, Decatur, Jennings, Scott, Clark, Floyd, and Harrison. In Kentucky, the counties affected were Meade, Hardin, Larue, Taylor, Casey, Pulaski, the western part of McCreary, Laurel, Clay, Leslie, Perry, Letcher, Knott, Magoffin, Morgan, Elliott, Carter, and Boyd, and those to the north of them. Also, the western part of Scott County, TN was moved from CT to ET. 1967-04-01: Under the Uniform Time Act of 1966, all time zones in the U.S. where DST was observed were required to follow a common DST schedule, from the last Sunday in April at 2:00 a.m. to the last Sunday in October at 2:00 a.m. Arizona failed to opt out, so it observed DST that year. Names of two time zones changed: Alaska Time became Alaska-Hawaii Time; Nome Time became Bering Time. Two new time zone names added: Atlantic Time for Puerto Rico, and Yukon Time for the small zone containing Yakutat, AK. 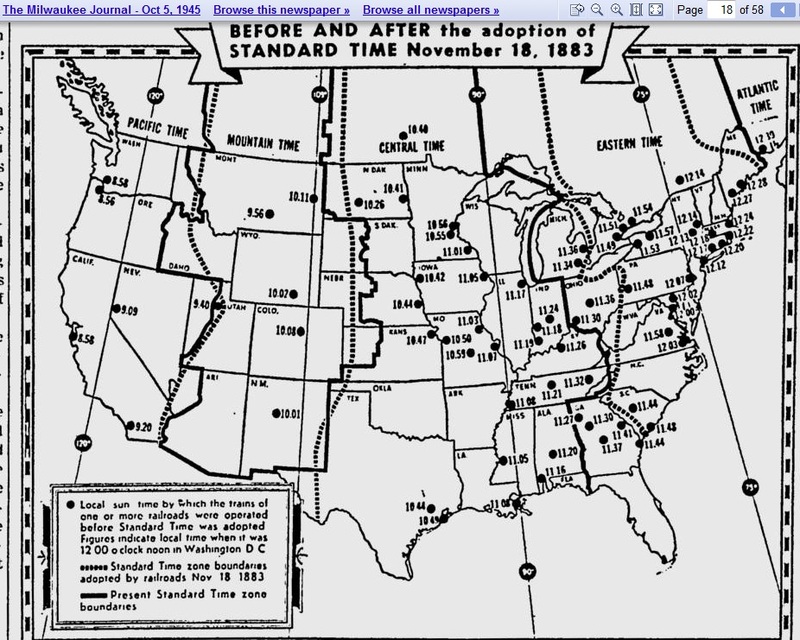 1968: AZ and MI stopped observing DST. Some time between 1968 and 1973, the Upper Peninsula of Michigan was switched from CT to ET, to match the rest of the state. Fourteen counties in ND, located south and west of the Missouri River, moved from CT to MT. 1969-04-27: All of IN moved into ET except for twelve counties: Jasper, Lake, La Porte, Newton, Porter, and Starke in the northwest, and Gibson, Pike, Posey, Spencer, Vanderburgh, and Warrick in the southwest. 1970-04-10: Secretary of Transportation authorized to move El Paso and Hudspeth Counties, TX from CT to MT. 1973: MI resumed observing DST. 1973: Switzerland County, IN moved from ET (with DST) to EST. 1973-04-29 02:00: Dickinson, Gogebic, Iron, and Menominee Counties, MI moved from ET to CT.
1974-01-06 02:00: The United States changed to DST ahead of schedule, as a response to the energy crisis resulting from an embargo on oil exports from Arab nations. Southern Idaho and eastern Oregon exempted themselves from the change at that time. 1974-02-03 02:00: Southern Idaho and eastern Oregon started DST. 1975-02-23 02:00: This was the start date for DST in 1975, except in the part of MI that lay in the ET zone. 1975-04-27 02:00: Most of MI started DST. 1976: Eastern Crawford County, IN, including Marengo, moved from ET (with DST) to EST. 1977: Pike County, IN moved from CT to EST. 1983-10-30 02:00: All parts of Alaska except the Aleutians and Saint Lawrence Island switched to AT. Prior to the change, Alaska east of 138°W (Juneau) had been on PT; between 138°W and 141°W (Yakutat) had been on Yukon Time, which was UTC-9 with DST; west of 162°W (Nome) had been on Bering Time, which was UTC-11 with DST. Name of Alaska-Hawaii zone changed to Hawaii-Aleutian. 1987: Annual start date for DST moved from the last Sunday in April to the first Sunday in April. 1990-10-28 02:00: Western Kearny County, KS moved from MT to CT.
1991-10-27 02:00: Starke County, IN moved from CT to EST. 1992-10-25 02:00: Oliver County, ND moved from MT to CT.
1999-10-31 02:00: City of West Wendover, NV moved from PT to MT. 2000-10-29 02:00: Wayne County, KY moved from CT to ET. 2000-12-23: Pub. L. 106-564 designated Chamorro Time as the name of the time zone for Guam and the Northern Mariana Islands. 2003-10-26 02:00: All of Morton County, ND, and the part of Sioux County, ND east of ND route 31 moved from MT to CT. Jones, Mellette, and Todd Counties, SD moved from MT to CT. (The area around Fort Yates in Sioux County, the area around Mandan in Morton County, and the eastern half of Jones County were already in CT). 2006-04-02 02:00: The entire state of Indiana begins to observe DST. Also, six western counties (Daviess, Dubois, Knox, Perry, Pike, and Starke) move from ET to CT. Previously, all but fifteen counties had remained on Eastern Standard Time throughout the year. The fifteen exceptions included five southeastern counties (Clark, Dearborn, Floyd, Harrison, and Ohio), which were on ET with DST, and ten western counties (Gibson, Jasper, Lake, La Porte, Newton, Porter, Posey, Spencer, Vanderburgh, and Warrick), which were on CT with DST. 2007-01-01: In accordance with the energy bill enacted on 2005-08-08, the schedule for DST became from 2:00 a.m. local time on the second Sunday in March until 2:00 a.m. on the first Sunday in November. 2007-03-11 02:00: Pulaski County, IN moved from CT to ET, as a consequence of a Final Rule issued by the Department of Transportation on 2006-01-17. 2007-11-04 02:00: Daviess, Dubois, Knox, Martin, and Pike Counties, IN moved from CT to ET by leaving their clocks unchanged. 2010-11-07 02:00: Mercer County, ND moved from MT to CT by leaving its clocks unchanged. I derived the following information by comparing time zone maps from different years. Using this procedure, I can only estimate the dates of changes. The maps themselves seem inconsistent, and in some cases may be showing de facto rather than de jure time zones. ~1942: Western Ohio and the lower peninsula of Michigan moved from CT to ET. My evidence for this is a statement in the Milwaukee Journal, 1945-10-05: "the interstate commerce commission has made several important changes in the boundaries of time zones, one of the latest being the transfer of Michigan proper and western Ohio to the eastern zone." ~1959: In KY, eastern McCreary County changed from CT to ET; Boone, Boyd, Bracken, Campbell, northern Carter, Grant, Greenup, Kenton, eastern Knott, eastern Letcher, Lewis, Magoffin, Mason, Pendleton, and Robertson Counties changed from ET to CT. The following counties in NE changed from CT to MT: Brown and Hitchcock; most of Hayes and Thomas; part of Blaine, Cherry, and McPherson; also, part of Lincoln County changed from MT to CT. Most of Malheur County, OR changed back from PT to MT, along with parts of Baker and Wallowa Counties. Eastern Scott County, TN changed from CT to ET. ~1963: The following counties in KS changed from CT to MT: Cheyenne, Decatur, Finney; Gove, Graham, Lane, Logan, Ness, Norton, Rawlins, Scott, Sheridan, Thomas, Trego, and Wichita; about half of Gray, Phillips, and Rooks; and smaller parts of Ellis, Ford, Hodgeman, and Sherman. The entire Upper Peninsula of Michigan went on CT. Formerly, the line dividing ET from CT in the Upper Peninsula had been an irregular curve. Chippewa, Keweenaw, Luce, and Mackinac Counties, most of Houghton and Schoolcraft Counties, and small parts of Alger, Baraga, Delta, and Ontonagon Counties had been in ET. ~1967: A few towns in eastern Nevada (Lincoln and White Pine Counties) changed from MT to PT. 1968: A Rand McNally road atlas shows about one-fourth of Utah, in the northwest corner, in the Pacific zone. I'm unable to find any other source confirming this. ~1970: The following counties in NE changed from MT to CT: Brown, Hitchcock, and Thomas; the remainder of Hayes, Lincoln, and McPherson; and about the eastern third of Cherry. The border between MT and PT in Malheur County, OR was adjusted to follow lines of latitude and longitude. ~1974: The changes to KS shown at ~1963, above, were reversed (if they were ever really made in the first place). The names Eastern, Central, Mountain, and Pacific have been used for the four time zones of the 48 contiguous states since the beginning of standard time in the United States. Alaska used to have four time zones: Pacific, Yukon, Alaska, and Bering. As of October 30, 1983, this was changed to the two existing time zones, Alaska and Hawaii-Aleutian. "Eastern Time" can be used to designate the local time at any point in the Eastern zone. "Eastern Standard Time" is used only when standard time is in effect at the given location; "Eastern Daylight Time", only when DST is in effect. The same pattern is followed in all of the U.S. time zones. Currently, the U.S. system of time zone names also encompasses "Samoa Time" (used in American Samoa), "Chamorro Time" (Guam and Northern Mariana Islands), and "Atlantic Time" (Puerto Rico and U.S. Virgin Islands). All of these zones are standard only, no DST. "ChST" is being proposed as an abbreviation for Chamorro Standard Time, but there is no approved way of abbreviating Atlantic Standard Time to distinguish it from Alaska Standard Time. These two maps are on exhibit at the Henry Ford Museum in Dearborn, MI. The earlier one apparently dates from before 1889, because it shows Dakota Territory, and Prescott as the capital of Arizona: Map. The other one is dated 1932: Map. "When Every City Had Own Time ", Milwaukee Journal, 1945-10-05. Here is the map from that article. It shows both the 1945 zones and the 1883 zones. The latter agree pretty well with the 1889 map from the Ford Museum. Copyright © 2001, 2003, 2005-2008, 2011, 2013 by Gwillim Law.